The STA-BIL® brand offers a range of products designed to treat all your engines—from everyday driving vehicles to collector cars, snowmobiles to boats—STA-BIL® goes above and beyond to protect like no other. Cars, boats, lawnmowers, RVs, jet skis, diesel engines…STA-BIL® products keep them all running smoothly year after year, providing protection for every engine you own. Not all engines are the same, and neither should be the fuel additives you use. 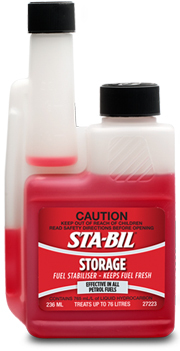 Every STA-BIL® product is specially formulated to treat each of your vehicles or equipment differently, whether they are on the road, in the water, or in the backyard tool shed. STA-BIL® products have been recommended by over 100 original equipment manufacturers, and have been used and trusted by consumers for over 50 years. Whether for day-to-day use or during long periods of storage, you can rely on STA-BIL®’s powerful fuel additives to protect your vehicle or equipment from today’s fuels. STA-BIL® Storage: Keeps gasoline fresh for up to 24 months, eliminating the need to drain your tank during storage seasons. STA-BIL® Diesel: Generators, tractors and diesel trucks require special additives to operate smoothly and problem-free. That’s what STA-BIL® Diesel is for: to keep diesel fuel fresh and injectors clean. STA-BIL® Marine: Specifically designed to prevent fuel related damage in marine engines. It protects against corrosion caused by Unleaded fuel, including Ethanol blended fuels, while also cleaning the fuel system for improved performance YEAR-ROUND. STA-BIL® Marine is formulated to help remove water and stabilises fuel. Recommended for use AT EVERY FILL UP in all petrol powered vehicles and equipment used in high moisture environments.